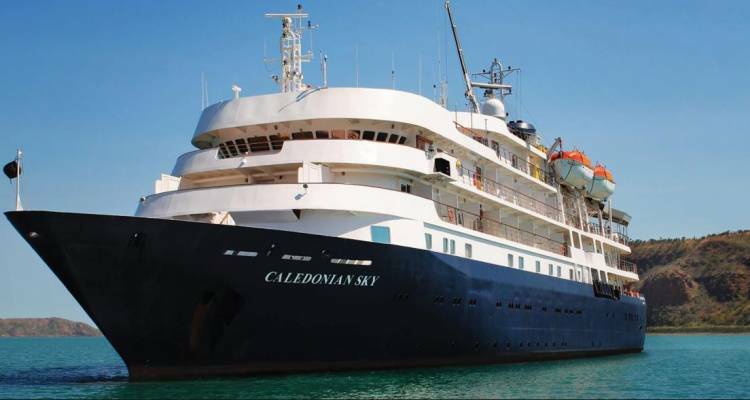 Enjoy an all-inclusive lifestyle aboard the MS Caledonian Sky. Timeless elegance is reflected in every detail, while intimate spaces and the company of like-minded guests foster a convivial ambience. Having undergone refurbishment in 2018, the MS Caledonian Sky now boasts a number of extra private balconies, while returning to the sophistication and classic style for which she was justly famous. Recently awarded a ‘Star Performer – Top Ten’ rating in the 2018 Berlitz Cruising and Cruise Guide, APT’s position as leaders in small ship cruising continues. All suites feature ocean views, elegant ensuites with a shower and/or bathtub and Molton Brown toiletries. In your suite enjoy the convenience of a mini-fridge, individual climate control and bottled water, as well as a sitting area, flat-screen television, telephone, wardrobe, safe and dressing table. Following APT’s inaugural New Zealand by Small Ship expedition in 2018, we are proud to be returning to the Land of the Long White Cloud in 2019. Only 57 suites accommodating a maximum of 114 guests. Crew of seventy-five, assuring personalised attention. On board, you'll enjoy first-class service from the attentive crew, whilst onshore, your specialist team and expert local guides bring your destination to life. The Captain and Crew - Aboard the MS Caledonian Sky, high quality service and attention-to-detail come as standard. The professional and attentive crew cater to your every need, and thanks to a high ratio of crew-to-passengers, you'll enjoy a level of truly personalised service that far exceeds your expectations. Arrive on board as a guest, and leave your journey feeling more like a member of your onboard family. Local Guides ;- We understand that in certain locations, it takes a local to show you the hidden gems that only residents know about. That's why, in most destinations on your APT Luxury Small Ship cruise, you'll gain a deeper insight and enjoy the added benefit of in-depth commentary from expert local guides. Cruise Director - From the moment you are greeted at the airport until your departure flight home, an APT representative is with you for the entirety of your holiday to ensure a stress-free and seamless experience. While on the MS Caledonian Sky, an APT Tour Director is with you. Guest Speakers - Expert guest speakers are sure to enhance your onboard experience. With their specialist knowledge, they will introduce you to the culture and history of the places you visit, as well as making themselves available for informal chats. Expedition Team - On an APT Expedition cruise, you'll venture into some of the most remote and intriguing corners of the earth. To ensure you get the most out of your adventure, all Expedition cruises are led and organised by our outstanding onboard Expedition Team. These hand-picked experts are specialists in their field. They are naturalists, historians and ecologists who will share their knowledge and enthusiasm with APT guests. They will coordinate the daily programme and hold talks and briefings throughout the cruise. Whether it be an historian retelling fascinating stories, or the marine biologist who dives into the open water to film a rare underwater scene for guests to experience on screen, your Expedition Team truly bring these magnificent regions to life. Depending on your itinerary, an exciting range of onboard entertainment awaits, whether it be an insightful lecture on the regions you're visiting, or a classical pianist performance in the elegant lounge. Exquisite gourmet cuisine is sure to be a highlight of your Luxury Small Ship Cruise onboard the MS Caledonian Sky. Each meal showcases world-class quality and impeccable service in true APT style. An Intimate Dining Experience - Dining on board your ship is a relaxed and friendly experience. Enjoy delicious, outstanding cuisine in the company of a small number of other guests. Meals are offered in a leisurely single seating, so you may enjoy a relaxed meal reflecting on the day's discoveries with new friends. Delicious Buffet Breakfast - In the elegant dining room, breakfast is served buffet-style. Enjoy the luxury of dishes cooked specially to order. Fruit juice, tea and coffee complete a fresh start to the day. Tantalising Lunch & Dinner - Friendly and professional table service means all you need to do is sit back, relax, and enjoy your meal. For lunch and dinner, you'll love the tempting choices available on our ever-changing à la carte or buffet menu. Dine Al Fresco - The MS Caledonian Sky boasts an outdoor dining area and when weather permits, meals can be enjoyed al fresco. Enjoy a Touch of Local Flavour - We recognise that a key part of Luxury Small Ship cruising is the opportunity to discover the local flavours of the regions you visit. That’s why we include many opportunities to sample the local cuisine on board and enjoy an authentic insight into regional cuisine. Where possible, our chef will obtain fresh local produce in markets or buy the catch of the day from a passing fishing boat. Included Beverages - As part of your all-inclusive lifestyle, complimentary beverages – both alcoholic and non-alcoholic – are served at your discretion throughout the entire day, including regional beer and wine. On board, 24-hour tea and coffee is available for your convenience.